In November 2010, days after the Republicans recaptured the majority in the House of Representatives, 32% of Americans pledged support for the Tea Party, or 10 percentage points higher than in the latest survey, conducted Sept. 5-8. 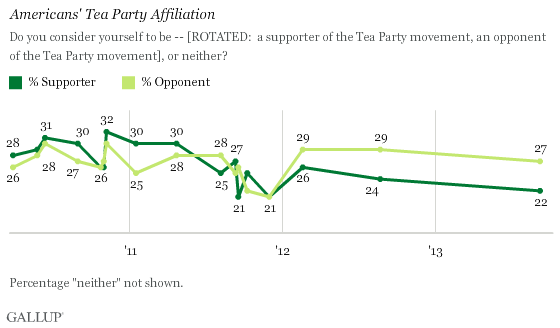 Opponents of the Tea Party now outnumber supporters 27% to 22%, which is similar to their edge in 2012. However this differs from most of Gallup’s earlier measurements, in 2010 and 2011, when supporters and opponents were either equally matched, or Tea Party backers had the slight edge. Fully half of Americans, 51%, currently say they are neither a supporter nor an opponent of the Tea Party, or they have no opinion about it. In addition to their overall advantage in numbers, opponents of the Tea Party also lead supporters in intensity. The majority of Tea Party opponents call themselves strong opponents, while supporters are evenly divided as strong and not strong supporters. The net result is that 17% of Americans consider themselves strong opponents of the Tea Party, contrasted with 11% who are strong supporters, similar to the balance seen in 2011. Yes, it is good that the number of supporters is on a downward trend. It is still scary that over one-fifth of the country supports a group which opposes the basic tenets of self-government which this country was founded on with their hysterical hatred of government (especially when there is a black president) and unquestioning support for plutocrats like the Koch brothers. Americans should know better, and far fewer should support the Tea Party insanity. Having half the country not taking a position isn’t reassuring either. The last time we faced a vote on the debt ceiling (which allows the United States to pay its bills, not increase spending), the Tea Party created a show-down which led to a downgrading of the credit rating of the United States and slowed economic recovery. Now that we face a comparable crisis, we need far more than twenty-seven percent opposing this extremist and dangerous group. Posted in Economy, Polls, Republicans. Tags: Conservatives, Deficit, Koch Brothers, Polls, Republicans, Tea Party. RSS feed for comments on this post.. TrackBack URL.